Two decades ago, if you had asked me what I did for a living, I’d have said food writer. Back then, I free-lanced for newspapers and magazines. My first cookbook was published in 1990. I had some success with that – it was a James Beard Award nominee – and it was followed by another two books. 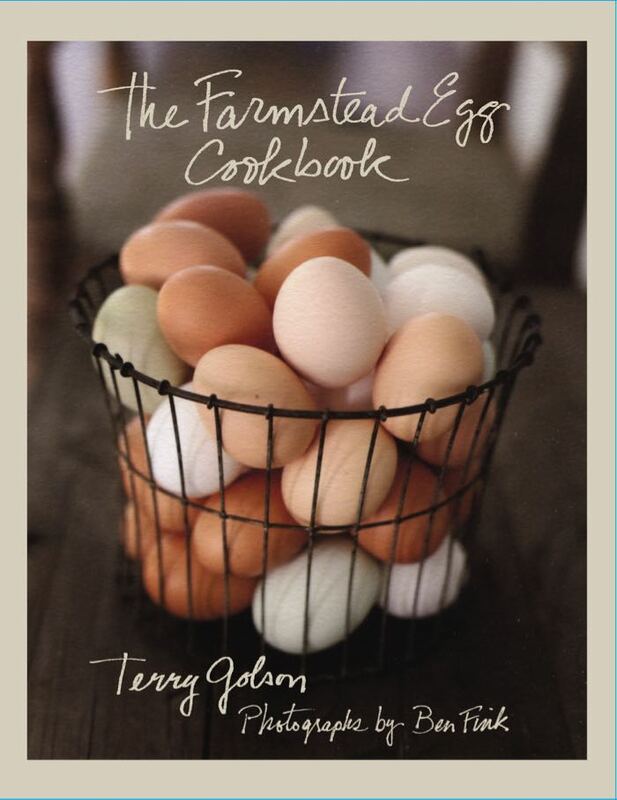 Then in 2006 I wrote The Farmstead Egg Cookbook. It was a sweet little book with nice recipes and gorgeous photographs. Sales were slow and the book soon went out of print, but that title changed the course of my career. I was told that I had to have a website to promote book sales. At the time most authors put up a basic site that didn’t include much more than a book description and an author head shot. I considered that. It would have been easy to do. But years before this, Steve had a crazy idea. Let’s put a live-streaming cam in the coop, he said. Broadcast it to the world. What? This was before Eagle Cam, before weather cams, before there were any cams at all except for a handful in academic settings. I nixed that idea. But it kept coming up, and I needed a website, and a live cam would be interesting, wouldn’t it? 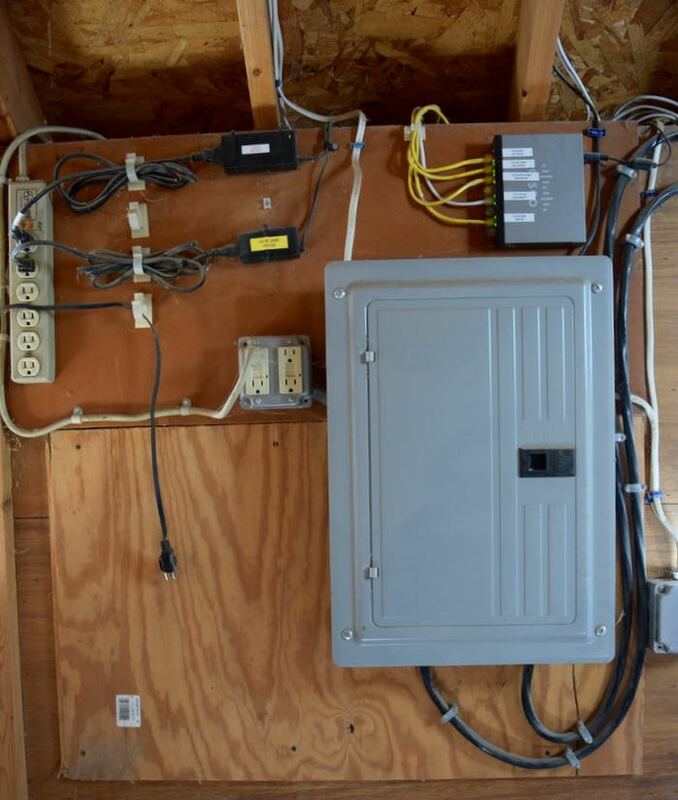 Installing and operating the cams was easier said than done. It wasn’t like there was kit to purchase. Steve had to figure out how to make this happen. We spent thousands of dollars on wiring, cameras and technical equipment to run it. Over the years we’ve spent thousands more on hosting fees and other computer necessities. Steve put in countess hours. Because of the cams, the website itself couldn’t be a stock template. I had to hire a designer. The cost exceeded any income that I made from my writing, but the expense and effort was worth it. HenCam did prove to be interesting. People came. HenCam went live in 2005. YouTube didn’t exist yet and there weren’t scores of cute cat videos to indulge in, but there were my hens. I started getting email from viewers asking about the animals that they were watching. 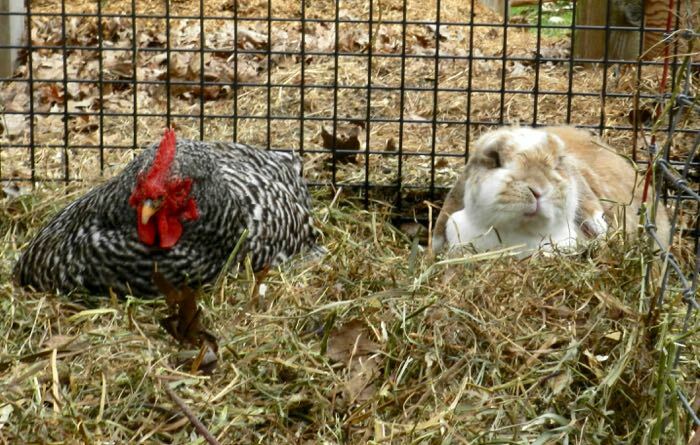 They asked questions, too, about chicken keeping, so in May of 2006 I started blogging. I didn’t realize it then, but this marked a shift in my focus. I turned from food writing to chickens. I can remember when I thought that the numbers were big if 50 people came to my website over the course of the day. This was before Facebook. There was no place to announce what I was doing and hope it’d go viral. People found me through word of mouth. I kept writing. More people found me. In 2009 I opened the blog to comments. Since then, there have been 31,000 of them. I have read every one. My site has seen 7.5 million visits. Most of my readers are in the United States, but they’re also from over 200 other countries. England and Germany, Canada and Brazil, Zimbabwe, India, and Indonesia. New Zealand, Australia, Korea and Poland. I’ve heard from troops overseas who watch the cams, dreaming of when they come home to their own home plots, and also from Afghanis (one touching note came from a doctor there who remembers better times when his father raised chickens in their backyard in Kabul). In the last ten years. I’ve written 575,000 words (that’s the equivalent of 7 novels.) I’ve written 2,000 posts. The vast majority of my writing has been about chickens. I’ve written about broody hens, manure and molting. I’ve delved into respiratory disease, internal laying and pecking order. I’ve written practical information that has helped thousands of people care for their birds. 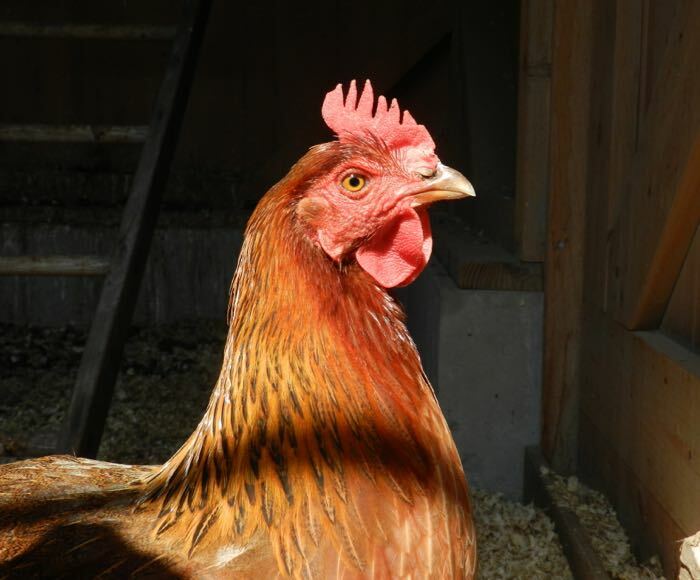 The most widely read piece is the What to Feed Your Chickens FAQ. It’s been read 771,331 times. Hundreds of hens have been saved with my Spa Treatment, and thousands of people have learned why their chickens are losing feathers. Over the last decade, I’ve set down what I know about backyard chicken keeping. If you have a question, it’s bound to be answered somewhere in those half-million words. All you have to do is type a key phrase into the search button and you’ll find your answer. Along the way, I also wrote a book for children, Tillie Lays an Egg, which was published by Scholastic in 2009. Teachers found me. Now classrooms from Alaska to Florida watch the animals live on computers and smart boards. Some use my blog in their curriculum. Just the thought of that makes me smile. Many of you don’t have chickens but you come anyway. I’ve used my flock as a lens to comment on the wider world. The themes of life, death, friendship, kindness, responsibility, and wonder happen everywhere, including in the coop. For many of you, HenCam has become a window to sanity, a happy oasis to spend a few minutes of your day. The internet can be a harsh place, with vitriolic trolls and people spouting angry opinions. I’ve kept them at bay here at HenCam. It’s been my happy place, too, but I haven’t sugar-coated it. Illness and loss are inevitable, as are the hard decisions that have to be made. I haven’t just written about the facts, I’ve also written about animals that many of you have come to love. You’ve reveled in Lulu’s antics and mourned when Candy died. You’ve celebrated the first flowers of springtime and shivered along with me when it snowed. It’s been great having your company. Ten years is an eon in internet time. In that span I haven’t taken a break or swerved from the focus of the my website and blog. But my chickens are only a piece of my life. I have other interests. You’ve seen glimmers of this on the periphery of HenCam. Twenty years ago I discovered the science of behavior, and ten years ago I became good friends with Karen Pryor one of the first proponents of what is now called “positive reinforcement training.” Last year I went through an intensive half-year dog training course to hone my skills. How I live my life is shaped by this perspective – of breaking down behavior into small, achievable steps and rewarding each success. It is a viewpoint that believes that the good in all of us can be brought out and maximized if only we see and encourage it. It’s a theme that has coursed through the HenBlog – the message is subtle but always there. After ten full years of writing about chickens, I’ve said what I’ve wanted to say about these wonderful animals. On this tenth anniversary I am saying goodbye to the HenBlog. I can’t thank you enough for listening to me, encouraging me, and sharing yourselves with me. HenCam won’t disappear. The archives will remain, as will the cams. Steve has figured out a way to keep the cams up in an affordable way so you can still watch the Girls. You’ll see changes in the next few weeks. Hopefully it will all go smoothly! I’m on Facebook and I also post on Instagram. In this world of social media, you’ll still be able to hear news of the Girls and the other animals you’ve become attached to at HenCam. But, I’m not going away! One part of my life that you’ve had glimpses of is that In the last few years is my love of horses. For awhile they were not in my life, but they’ve always been on my mind and in my heart. I have a university degree in animal science. Through my twenties I was a full-time horsewoman. I left that for food writing. Now I’m back, not only as a horse owner, but also as a professional. No longer writing the HenBlog will mean that I can turn my full attention to horses. I’m bringing what I now know about the science of behavior and ethology to bear on how I work with these animals. The horse world is in need of a kindness-based, science-backed approach to training. I’ve already taken on a few students, and I love working directly with people and their horses, but at heart, I’m a writer, and I’m itching to do for horses what I did for chickens. Closing the HenBlog opens up the time to write a new blog at my other website, The Cooperative Horse. I know that many of you who have followed the HenBlog don’t have chickens. I’m hoping that you’ll continue to read my posts at Cooperative Horse. Perhaps some of you that have chickens but don’t have horses will follow the Cooperative Horse blog, too. I hope to see you there. Sad to hear that you’re not going to updating your blog, I’ve really enjoyed reading your lovely posts and watching the hens’ antics on the webcams on a frequent basis. I found this blog a few years ago, through my interest of keeping chickens (I’m sure my mum’s sick of me constantly asking if we can get some hens! ), and this has certainly been an inspiration to me for when I get older and can hopefully have my own. Through this blog and your invaluable expertise I’ve really broadened my knowledge on the upkeeping and maintenance of chickens. I’ll continue to read old posts and watch the hens, but for now best wishes from England. Katrina, thanks so much for these kind words and I’m sure at some point you’ll have that flock of your own. I am both happy and sad at this news. Happy for you in your endeavors and sad at the loss of this blog. I have learned so many new things about chickens and enjoyed the community here. All thanks to you. I can’t promise to be a regular at your other site, not in any part due to you. The lack of horses in my life is very painful and I can only stay sane about that by keeping them at arms length, if you get my meaning. But I will pop in from time to time, just ’cause. Best wishes to you and many, many Happy Trails! Believe me, I understand about the horse thing and how hard it is not to have them in your life. It’s been wonderful hearing about you and your animals in these comments. I’ve always appreciated your attitude and approach to your critters! Good luck Terry. Life is a great journey you are partially closing one chapter and opening the next. ENJOY!!!! I will have to friend you on facebook tonight so I can stay in touch with the hens, goaties, Lilly and of course that ever adorable Scooter. Best wishes Terry. I have enjoyed your blog and the webcams over the years as well as your reconnection with horses. I have a horse (or more accurately, we have each other) and will be getting hens in the coming months. The best to you and your human and animal family. I look forward to your horse blogging! Hens and horses are a very good combination. I look forward to seeing you over at Cooperative Horse. Terry, congratulations on your new focus. Organic change is always good and when it’s aimed at horses…well, what could be better. I look forward to clapping –hard– when your training approach gets even more traction. As I’ve said here before: Don’t stop, don’t stop, don’t stop. Again, congratulations, and see you soon! I look forward to hearing your marvelous horse stories over at CH. Best of luck with your new endeavor! I will miss the Hen Blog very much. Your writing helped me raise my first chickens and deal with their crazy antics as well as their illnesses and deaths. Your Spa Treatment has been invaluable but even more so has been your kind and patient attention to your animals and ability to discern their motivations. Now I have new chicks in the brooder and will be studying the archives on how to integrate them with Scarlett and Henny Penny. Looking forward to hearing more about Tonka. It’s been wonderful having you here with me at the HenCam. Good luck with those new chicks! I thought I’d need new chicks this year, but those old hens of mine are going along as strong as ever. I feel sad to hear this is coming to an end and actually have a bit of a lump in my throat. I have been keeping chickens and my chicken blog for five years now and have been reading yours for a few years before that when I was trying to sponge up your knowledge ready for my own chicken keeping. You have helped me with chicken problems over the years either just by reading here or occasionally by e-mail advice. I follow six chicken blogs but yours has always been my favourite and yours is the most consistently updated. I have enjoyed the interaction of the comments too and have learned so much. That said, I wish you lots of luck and happiness with your new venture. Everything moves on and I understand the need to change direction. I will so miss your stories and photos of all your animals but will pop in to your other blog and who knows, I will probably end up following that one instead. You’ve been a consistent presence here, and I’ve appreciated all of your comments. So sorry you are stopping your hen blog. I have found you wise words so helpful and encouraging. I now have 2 little flocks of my own. A mixed flock of big girls of different breeds laying different coloured eggs and a flock of bantam Polands just because I love them! Best wishes with your new focus and whatever life brings for you and your family. Oh, bantam Polish. What fun! Thanks for being part of this. It is a wonderful thing; change. I wish you the very best and since I am a fan of horses, especially working horses, I will pop on over to the Cooperative Horse. Have fun when you get your chickens! 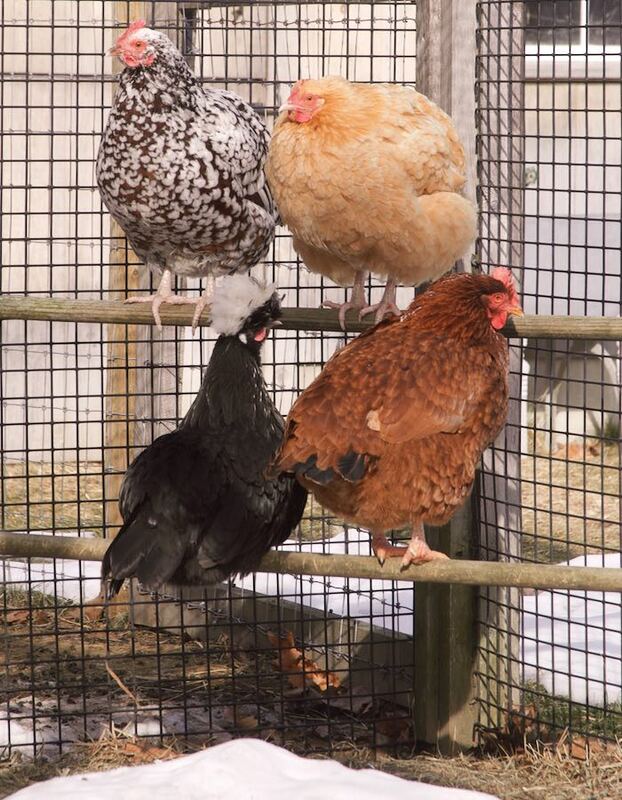 Thanks for sharing the wonderful world of backyard hens. I’ve enjoyed it! Fair winds for your new ventures. I`m sure this was not an easy decision for you even though you must have been thinking this conclusion had to happen sooner rather then later.I applaud you for going ahead with your new ventures. I can`t thank you enough though, for all the time and energy you have devoted these years to teaching wonderful life lessons via this chicken blog and all the beautiful creatures at `little pond farm`, not to mention guiding us newbies through the process of chicken keeping in a wise and compassionate way. I have also really enjoyed the community here and will miss you all. See you at the CH! I found your blog when I was thinking about raising chickens. My mother is afraid of birds, so I had never been around them. Reading your blog and catching up on all of your older posts made me believe that I could have a flock of my own. I got my first 6 chicks about two months after you received the last group you raised. It was so helpful to watch you and the your chicks as they grew and I felt confident that I could keep those babies healthy and safe. I am now enjoying eggs from both the three year old hens and my 7 month old hens. Thank you so much for all of the wonderful information and best of luck with your new passion! I’m so glad that I was able to help you get started with hens. As Robin says above, “Happy Trails”. See you around! Keep doing those good things with your flock! I have also enjoyed this site very much, and have learned a lot about keeping my chickens, and I know I will be returning to your FAQ section. I will also be checking in your Cooperative Horse site as I have been ridingl/conditioning horses for about 50 years and have seen many, many changes in training methods, from “rope and throw”, ride’em cowboy until they quit, up to the now much, much better methods. You never quit learning something about horses no matter how long you have been with them. I have enjoyed all the comments, pictures and blogs on this site, and will be seeing you on The Cooperative Horse. That’s great that you’ll read my horse blog, too. Sending my best wishes in your new adventures, Terry. I never even thought of getting chickens until I found you and Hen Cam. Maybe I’ll get a horse next! I’ll be reading along as usual. Horses aren’t quite as easy as hens :) but so good to get to know. Congratulations on your new direction, Terry. Many thanks for all of your time spent. Your efforts have been appreciated by all of your readers. Here’s a wonderful story about backyard chicken farming in Labrador! Great pictures too. Thank you so much with all of your chicken info and stories. I might not have always commented, but I was here watching and reading. I’m excited for you in your new adventure! Thanks for keeping this website up so we can enjoy your girls and look back for information that you have shared. You have been a huge help to me as I was raised a city girl who grew up to love the country and their critters. Bless you Terry! Terry, I wish you the best, for that is what you have given to your readers through the years. I am a sponge and have learned so much from you. Horses were a part of my life in the past and even though I no longer ride, that does not mean that I can no longer learn and enjoy. Thanks for the last ten and here’s to the next 30!!! Terri, I will miss the blogs you have been there from the beginning of my dive into chickens. You have always answered my e-mails when I was having troubles even though you were so busy. I was so excited the first time I met you, at that little holiday craft show. You may as well have been a movie star to me. Next meeting was at the Big E , it was a long drive but I had won one of your postcard books, I think I told you that a few days prior to my winning the book some friends of mine won ten million on a scratch card. But I was excited about winning my book. I came to your chicken keeping workshop and got to meet all your babies, I loved it, and learned so much, but I still don’t think I can do what Steve showed us. So with fondness and sadness I too am saying goodbye to hencam. Hopefully our paths will cross again. I’m confident they will. I remember all of our meetings – I’m sure there will be more! Best of luck with your Cooperative Horse endeavors! I grew up riding and eventing but now those interests have evolved into chickens and mountain biking. Still love dressage though. Thanks again !! Thanks, Teresa, yes, those FAQs and blogs will remain up. We’re figuring out a way to reduce our hosting fees so that it’s not so expensive, but that won’t affect the content. Like others, I am both sad and happy for you. I have learned so much about chickens from you, including things that explained my own hens’ problems and antics. But what I have always loved most, above and beyond the practical help, has been your heartfelt thoughts and feelings and evolving life philosophy that you have shared with us. And, just the way you have included posts about Tonka, and The Beast, your garden, the goat boys and the pups, in a blog mainly devoted to chickens, I hope you will keep ‘trade’ hens for horses as the main focus, and keep us abreast of all the other beloved characters, now and then. I totally get the ‘done with that part of my life, moving now into a new one’. I look forward to keeping up with your adventures in the future. Big hugs to you, and best of luck. Those characters will remain in the picture, just not as the center plot line. I’m sure I won’t be able to resist writing about Agatha the next time she does an Agatha sort of thing! I relish the role of match-maker between two of my favorite students. I’m sure we’ll all stay in touch. Well Terry…you’ve taken me through some rough times and I think that I have listened well and developed a common sense and pretty thorough but relaxed approach to our hens. We now have a healthy happy flock of 8 in what neighbours describe as a hen castle. Your advice, support and encouragement and level head has been greatly appreciated. Thank you for offering so much over the years for so little…we need more of that! All the best! Lisa, your thoughtful questions and interchanges with me made me a better hen-keeper. It’s been a joy to see your flock blossom. This is indeed the end of an era. Thank you so much for being such a regular and informative blogger and so well supported by Steve. It is good that the archive will still be accessible, and that we’ll be able to see the girls. I am so pleased that I have treated them periodically, but well recognise the tremendous financial investment you have made over the years. I wish you well in your new venture and shall follow you via FB. Good luck, and once again, immense thanks for all you have given to the back-yard chicken keeper and for the sheer pleasure of watching and reading about your successive groups of girls. I so appreciated your gifts of “treats” for them and “coffee” for me. Truly, those contributions kept the site up. The best to you Terry and thanks for the past years of Hen Blog. Though I don’t have hens or goats or rabbits or not even a dog anymore I really enjoyed watching your animal family. I don’t have a horse either but will switch over to The Cooperative Horse! Good luck to you. Marie, you’ve been part of this for so long, I’m so glad you’ll join us over at Cooperative Horse. What’s going on with the chickens, they are soaking wet and don’t seem to be able to go into the barn? I opened their big door and forgot to open the pop door, then closed the big door!!! But, as you can see, once allowed in, they got a bite to eat and then they went right back out in the rain. You are the ultimate mama hen, yes, I too will miss your informative blog. Thank you for teaching us all so much about chickens! Eight years! So glad to have you along on this journey. As someone already wrote here in the Comments, I´m sad and happy. I wish all the good luck in the world for you in your new project, but at the same time I´m extremely sad that you´ll no longer update the henblog. I found it throught an article in Backyard Poultry magazine (which I discovered in a hidden corner of a bookshop here in Brazil) and since then (2011, I guess), I come here every couple of days to watch your girls and read your amazing chicken posts. You don´t have idea of how much I learned! As you said, your website is an oasis in the middle of so much negative stuff on internet. One more time, good luck and thank you very much! Renata, I remember when you contacted me – I was (and still am) so excited to have a reader in Brazil. And then it turned out that you are a kind animal lover. Even better! Thank y for sharing your life, experience, knowledge and stories with us here. And thank you for keeping the archives alive, at least for now. I already follow you on Facebook and Instagram, although I don’t frequent either of those as much as I do the hencam. I’m not a horse owner, but I do enjoy learning what you do, and hope to see the other members of your animal family there from time to time. I wish you the very best for CH, the next phase of your life, and your new career. Vicki, you’ve been with me for a long time. It’s been such a pleasure having you be part of this community. Do drop in, and comment even it’s it’s just to say hello so I know you’re there. I’ve been following your chicken adventures since just after you started. I had my first flock in 2006 and have been oh so grateful for your advice and sound common sense over the years. Thank you from all my ladies – the Spa Treatment has almost always brought relief (and in my imagination, a happy little glint in their eyes!). I remember needing to share my joy when Ruby hatched 11 out of the 12 eggs she was sitting on – and you were the perfect one to share it with! I still have one of those ‘chicks’ – Ethel is now a grand old lady of 8 years old and still as perky as ever! I’m so glad your FAQs will still be available, both for myself and the many friends to whom I have recommended Hencam. Thanks again and all the best in your new venture. Tonka is such a handsome boy and you deserve to be able to spend as much time with him and his kind as you want. Happiness to you and yours! Oh I remember the amazing Ruby! Thank you for being part of this for so many years. Well, I like so many others am both happy and sad at this new bend in the road…happy for you and all the beautiful horses and owners who will so benefit from your sage wisdom and positive approach and so incredibly SAD for ME. I have learned so much from you Terry and thank you from the bottom of my heart for all the knowledge you have shared over these many years. My flock is healthy and happy; housed well, fed well and cared for practically and kindly due in a large part to YOU. Thank you and I wish you the very BEST BEST BEST of luck on the Cooperative Horse as well as any other venture you embrace in the years to come. Terry, you truly have inspired me and I am grateful. God bless you and your family always! It’s so affirming to hear that there are happy and healthy flocks out there because of my advice. Thanks for sharing. I held my breath as I read this post. I’m so happy for you, yet, so sad to see the Hen blog time come to an end. Thank you, thank you, thank you for all you and family have given! Your thoughtful, gracious, honest, and kind posts have helped innumerable flock owners and their chicks. In fact, this weekend my husband and I were talking about “Grandma” who is still living a year later as a result of your spa treatment. She’s now six! However, my gratitude is rooted in finding your blog after my stepson begged this city girl new to acreage for chickens. The confidence your blog and resources provided empowered me to grant his request–helping us build a bridge. I’m ever so grateful. Thank you for allowing us to continue watching HenCam and reading your work. I look forward to following Cooperative Horse, but my husband may block the site, if I begin asking for a horse :). Somehow, chickens often bring other animals into one’s life. Goats… rabbits… horse! I’m so happy to hear that Grandma is still going strong. Terry thank you for all the helpful advice, laugh out loud posts(I’m thinking about Candy now), and opening your home to hen care workshops. I felt confident going into chicken keeping knowing that the answers to any problems could be easily found on your site. What a treasure you and this blog are, and so many will miss it for sure! On the other hand, I’m so happy that you can channel your energy into another passion! There will be many horses and their owners who will be thankful for you and your training methods. 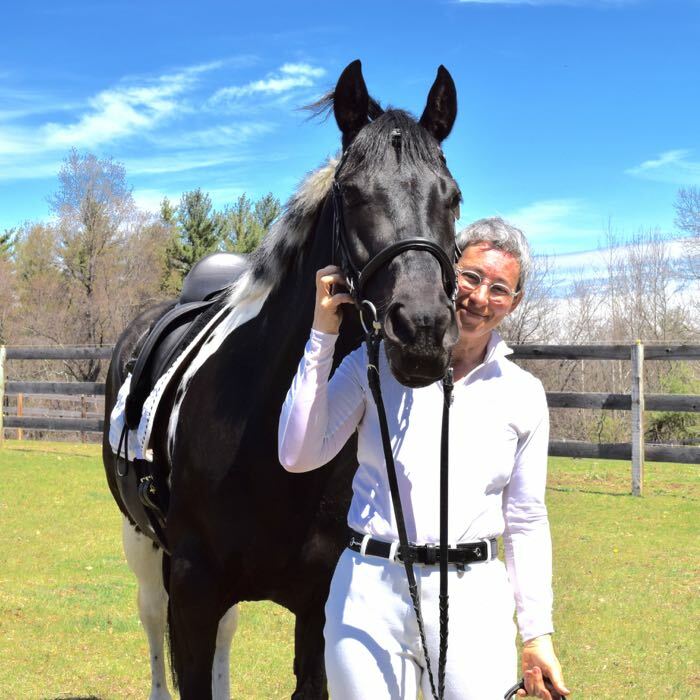 I too have gotten back into horse ownership after about 30 years, and I am so blessed to have a wonderful trainer who is a recent graduate of the L program. She is just as proud of me and my aging Tennesee Walker, who didn’t even have a true trot until recently, as she is her upper level riders and horses. If you ever want to bring Tonka to York and ride on the beach, we will put you up! Oh and Beryl and Topaz are still enjoying life here…….and still going broody from time to time! I will take you up on the beach ride. It’s something I’ve wanted to do for ages! I’m very sad to hear that you won’t write in Henblog anymore… I discovered your blog recently by typing my first name Edwina on Google ! ( i saw a post about a domineering hen whose name was Edwina too! Very interesting and very strange too) actually since my childhood i have a big fear of hens… Im very scared of these animals they are my nightmare! But i don’t know why, i read all your posts and watched the cams daily and slowly, little by little i started to get attached by these animals and feel a bit less scared… My favourite bird is Pearl… I want to thank you for that, for your little stories about hens… And you wonderful style of writing! Your stories were so lovely .you managed to analyse the hen ‘s behavior as if they were human and now i see them as human being and not as monsters!!! Im still scared but less than before! Thank you very much Terry for these wonderful moments! Edwina was named after a brilliant pioneering female geologist, so, love your name! I’m pleased that my hens are getting you over your fear of chickens. Sorry to see the hen blog go, but it is clear your major focus has turned to horses. I think it’s an itch you have wanted to scratch for a long time. And I look forward to learning about horses just as I learned about hens (and goats and rabbits). But before you move on will you update us on the nursing home hens? All the best. I haven’t been in touch with the nursing home for some time, so I am assuming all is well – that was the hope, that they’d be able to get going and be independent. So sorry to hear it’s all ending Terry, but nothing lasts forever (well, very little anyway) and you should move forward when you feel the time is right. I’ve watched with interest and fascination as you work with Tonka, although I’m not a horse person, so will keep in touch through your new site. A big thankyou to Steve, too, who made it possible for me to sit up in bed at night and watch the antics of a flock of hens on the other side of the world, (after watching my own flock do all the same things each day). Oh, and not to forget Candy and Phoebe, too. Thank you, Terry and Steve. Not a stupid question :) Go to the CH blog and there’s a super-easy subscribe button. We’ll miss you, Terry, but understand. We’ll never forget coming down for the Hen Keeping Workshop. We’ve lived in the ‘bush’ up west of Ottawa for nineteen years and have had our four hens for the last four years – wish that we had started earlier. You gave us the courage to start a flock and supported us everyday in raising our day-old chicks to wonderful strong responsive hens. Thanks, Steve, for your fine efforts in making the site so interesting for all of us. Best wishes to you both. It was such a pleasure to meet the two of you! So glad that your flock is thriving. What a fantastic blog, I should try this with our rare breed poultry, would love to see the Silkies. Terry: You will be amazed how I originally found your website. I am sure we all remember all the snow you had two winters ago. I am a weather watcher and was looking for web cams to see the storms first hand and all the snow. I came across your web cams and have been hooked ever since. Personally, I have been frightened by all birds, including chickens, most of my life. Your insight made me realize what wonderful animals the chickens truly can be. My granddaughter and I have enjoyed watching them in all seasons but Phoebe is truly her favorite. I am also a horse person so count me in on your new endeavor. It is true, I come to this page everyday. It offers peace and sanity in a world that at times seems to have lost that perspective. Thank you for all you do to make my life better. I had no idea that the HenCam was helping to get people over their chicken phobias. How wonderful! It’s been great having you and your granddaughter here, and I look forward to your comments over at CH. See you at the Cooperative Horse! Since my decision a year and a half ago to bring chickens into my life you have been my go to resource for information,insight,and enthusiasm.And like you,I see chickens and their care as a small window into a larger world.I will miss your blog but will continue to check in on the hens,goats,and rabbit daily.Thanks. I’m so glad you found the HenCam! I understand the need to devote the time to other things now. I want to say thanks for several things…for commiserating when I lost a hen to a terrible accident in the coop. I needed your input and thank you for emailing personally. I also thank you for just having a fun place to visit when I had chemo and just wanted to escape to a warm coop…wasn’t allowed in my own at the time. Ah, well, things change, and I know that horses everywhere…and their owners…will learn wonderful things from you! It was wonderful to meet you at the writer’s group here in NH, where you inspired many of us writers (I have finished my novel and started another). I used to have horses when I was young…long story there. So wish I had known then what I have learned from the blogs! Sometimes you learn that what you might love is not such a good fit after all and should be enjoyed through someone else’s eyes! I will visit the Cooperative Horse. Thank you, Terry, for giving your audience your time and efforts to enlighten and entertain. It is much appreciated. I’m so glad that my hens and I could be there for you. So exciting about your novels! Thanks, Connie. I already posted an adorable photo of adorable Scooter on my FB page. More to come in the future! Thank you Terry, I have enjoyed reading your blogs for many years and you have helped when life got a little heavy. You have a knack for writing and will miss your insights. Wish you the very best and Thank you again for sharing your life and chickens with all of the world. Hey Terry – Kinda sad you won’t be focusing on chickens but turning your attention and writing towards horses. Just a selfish thing on my side. Noting that your HanCam will still be up and running as a resource is great news. I will now need to read your 4-legged posts for my “Terry Talk” (I just admire the way you weave words together). Thanks for the coffee! Am about to make a cup right now. It’s generous readers like you who have kept me writing all of these years. Oh Terry we will miss your hen blog. I can see from all the comments that I am not alone in having gone to your blog and cams for more than just information. You have been an inspiration and a friend. I will follow your new adventure. However, I am also grateful you are maintaining the archives of chicken information. I wonder if you’ve considered putting that together as a book? There are so many myths that cause real harm and discomfort to the hens kept by the uninformed who ride the wave of new fads without knowing what they are doing. I know that many of them have found their way to you, for which I am sure their hens are grateful. It’s been wonderful hearing about your chicken keeping in the middle of Hawaii! About a book – to be honest, there’s no money in it (really, most authors, like myself, don’t make a living at it), and it would take a huge amount of time. I’ve reached more people via HenCam than I ever did (or would) through a book. I’m so grateful to have this on-line medium. well, I do understand about that! by the way I grew up with horses and was lucky enough to have two separate large herd experiences as well as keeping a couple of beloved backyard horses until each was over thirty years old. it was a perfect way back when you could just ride out of your gate and go anywhere,but I no longer keep horses in my pasture because the traffic has grown up around me and there is nowhere left to ride without trailering. I love hearing about old horses in one home. My hope is that Tonk and I have 20 years and we retire together. So sorry to see you move on. I found you when I started my journey with chickens, and found you to be excellent with your advice, and a joy to keep up with on a daily basis. Best of luck with your new adventure, you will be missed. Donkeys are on my list, too. Delightful and challenging. Rather like goats! Thanks Cassie. And thanks for all of your support over the years. I will miss the hen blog. Your advice has been invaluable and have loved your posts , facts and humor. Will miss this blog but wish you well on your future endeavors. And of course will have to check out the other blog from time to time. Thanks you for all your hard work. So glad you will stay have the cams up. The cams now have sound! Enjoy! I’ve followed your post for almost 5 years. My 2 remaining hens are 5 now. Thank you for teaching and entertaining me through your site. I will miss your hen blog daily but glad to hear I can still see the cams and find advice. That is a full house, especially for Belmont. Keep an eye on my FaceBook page where I’ll continue to mention the hens as situations arise. So sorry to hear about Twiggy, she was such a wonderful character and so full of energy, glad you don’t let them suffer to the end. It always surprises me to read about cancer in chickens they seem to get a lot of illnesses that humans get. Sorry unable to put comment on Facebook. Hello, Terry– It is selfish of me. but I mourn the loss of your hen blog because of the loss to myself. It was important to me for a serious reason. I could “escape” to your reporting on a daily basis from the plethora of grim news going on in the rest of the computer world. Your oasis of calm and peace in a disturbing and unsettling world of war, politics, murder, and quarreling made a huge difference to me in my daily life. You brought humor, compassion, and insight into day-to-day living. You were active. You cared. You made a difference. You taught things worth learning with your chickens, your goats, your dogs, your horse, your cooking, your gardening, your trips, your family, your various endeavors. I could tell you about my Mexican burro, Jenny, and you were interested and you understood how I could care for her so much. I had raised chickens 60 years ago, mostly Rhode Island Reds, because they were the chicks that were mostly available in the Purina Feed Store of my childhood. I was active in 4-H with my burro and my flock and my gardening and sewing. You made my own experiences more vivid to me. Even though it was in retrospect, I learned a great deal I wish I had known then, and had some old mysteries cleared up. I think you would enjoy knowing that when a veterinarian moved in two houses down, with children of his own, I was a frequent visitor to his house with an ailing hen under my arm! He never charged me! The neighbors hated my roosters crowing in the wee small hours, but didn’t complain because they liked the eggs I sold them. And another thing. I have become deaf as I have aged. It is an ongoing struggle to understand people and not get testy and depressed as a result. It is a pleasure to know how well you cope with it. It makes me feel less alone. I’ll be looking in on your horse blog, though I never had a horse, and your Facebook page, too. Thank you for the hen blog. It was your gift to me to be part of the HenBlog.